When Francis and Vanessa of Gustus Vitae Condiments first sent me samples of their amazing spices and salts, I didn’t know which one I wanted to try first. I decided on the red wine sea salt as it sounded so original as well as ingenious (sea salt and red wine being two of my favorite flavors). I’ve often had red wine risottos and liked them but found them a little overpowering especially paired with an actual glass of red wine so the idea of being able to sprinkle some over the top of a classic saffron risotto seemed like the perfect solution. I’m going to try Taste of the Southwest on some skirt steak next! 1. In a dutch oven or heavy saucepan, add 2 tablespoons of butter, olive oil and onions. Sweat until translucent – about 5 minutes. 2. Add the rice and cook on medium-high for 2 minutes. Stir continuously so the rice is coated with the fat and onions. 3. Lower the heat and slowly begin to add the stock; one ladle at a time. 4. Stir continuously and only add another ladle of stock once last ladle is absorbed. 6. Turn the heat off just before you think the risotto is ready (about 20 minutes after you’ve added the rice) – rice should still have a slight bite to it. 8. Stir in the asparagus, the rest of the butter and the parmesan cheese and cover for a few minutes to let everything blend together. 9. Serve in warmed bowls and sprinkle a little red wine sea salt and extra grated parmesan on top for a pop of flavor. This recipe calls for fresh asparagus, minimally prepared to bring out the vegetable’s naturally distinctive, delicious flavor. This dish is ready in about 15 minutes and pairs well with fish or meat, as its own course or as a fresh and flavorful snack. 1. Wash the asparagus and angle-trim to uniform length. 2. Steam until bright green and crisp but easily penetrated by a fork (about 10 minutes). 3. Drain and rinse in cold water and return to the pot. 4. Toss with the juice of one lemon (about 2 tablespoons) and butter. 5. Plate and sprinkle a dash or two of Sel Magique over the asparagus. 6. Garnish with lemon slice and serve warm. Last week I was fortunate enough to have lunch with Louisa Shafia, the woman behind Lucid Food and the author of the upcoming The New Persian Kitchen. Louisa has also kindly donated a recipe to Many Kitchens featuring sumac which looks delicious! 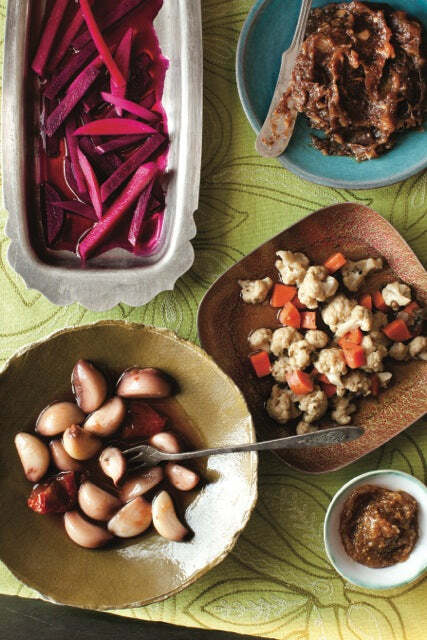 This sublime condiment brings together tamarind, lime, ginger, cinnamon, and sugary dates. Once pickled in the tamarind, the dates crystallize and dissolve into a soft paste similar to a chutney. After 6 weeks, the pronounced salty flavor of the sumac will mellow, and you can enjoy this fragrant pickle on everything from burgers to fish to cheese. For an easy hors d’oeuvre, spread it on a cracker and top it with lime powder–seasoned grilled shrimp and a fresh green herb. The chutney will separate slightly over time, so stir it from the bottom before serving to bring out all its tart lime goodness. 1. In a large bowl, whisk the tamarind with the lime juice, sumac, kosher salt, garlic, ginger, and cinnamon. Add the dates and toss well. 2. Transfer the mixture to a clean glass jar and add more lime juice as needed to cover any exposed dates. 3. Seal and store in the refrigerator. 4. Shake every few days to break up the crystallization. The dates will be ready to eat in 6 weeks and will last for about 6 months in the refrigerator. Reprinted with permission from The New Persian Kitchen by Louisa Shafia, copyright © 2013. Published by Ten Speed Press, a division of Random House, Inc.
1. Slice squash into small matchsticks (preferably with a mandolin to keep even sizing). 2. Add squash to a medium bowl and season with salt. Let stand for 10 minutes then squeeze off all excess water. 3. In a large saute pan over medium-high heat, melt butter and add squash. 4. Sprinkle vinegar over squash and stir. 5. Add flour, lower heat and cook for 10 minutes. 6. Add sour cream and sugar and boil for 2 more minutes. 7. Add dill, stir and remove from the burner. 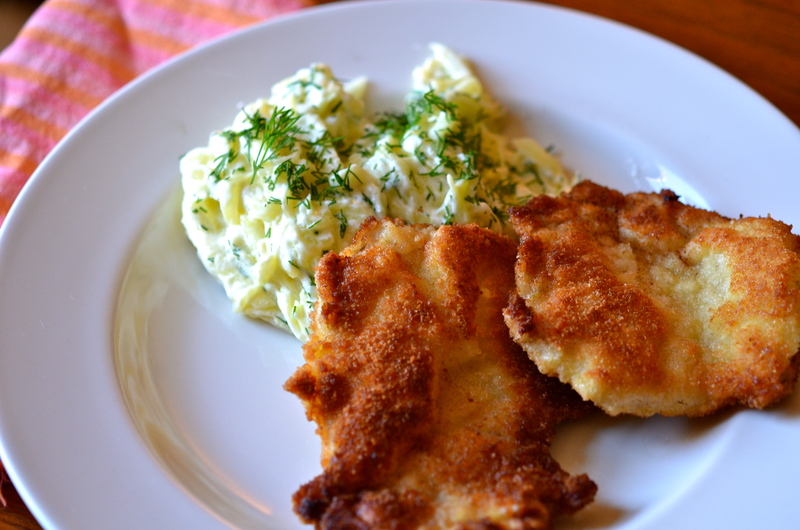 This dish is best served with Wiener Schnitzel. I hope you enjoy!